I just inherited a very nice J6, it has a four digit serial number 8912. I believe it was manufactured in the 1980's, in Japan. Not being an expert on these guitars, any help would be appreciated. Not so fast. You can't determine origins just from a serial with no pics. And all the four digit serials I've seen were on Korean models. Samick didn't start using the S prefix until 1992. And Matsumoku went under in 1987, so anything after that is not Japanese unless they switched to a different factory for a year or two, which I'd say is unlikely. You also see Samick's trademark extra-wide bridge, also used on the Epiphone Sheraton (which they made) starting in 1988. 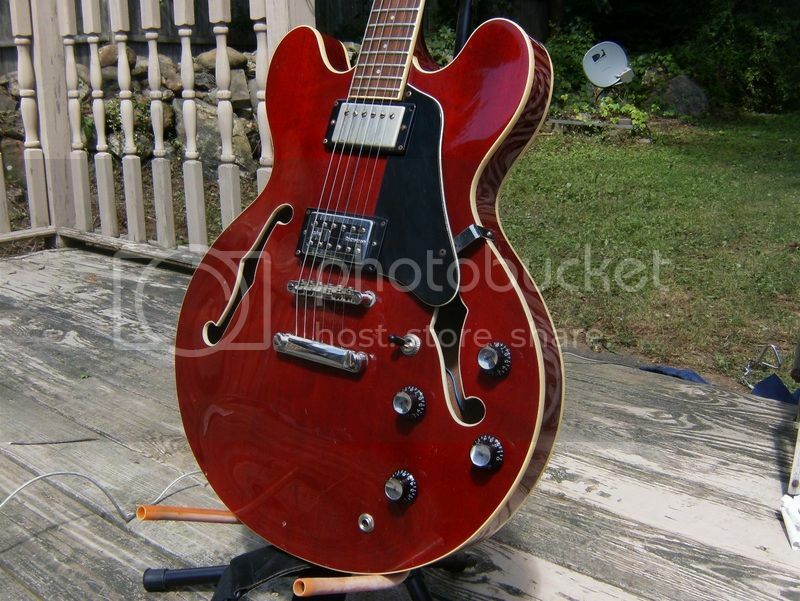 Samick used mickey mouse ears from 1982-2000 on their 335s. I do agree that the first digit on the four digit serials is likely the year though. 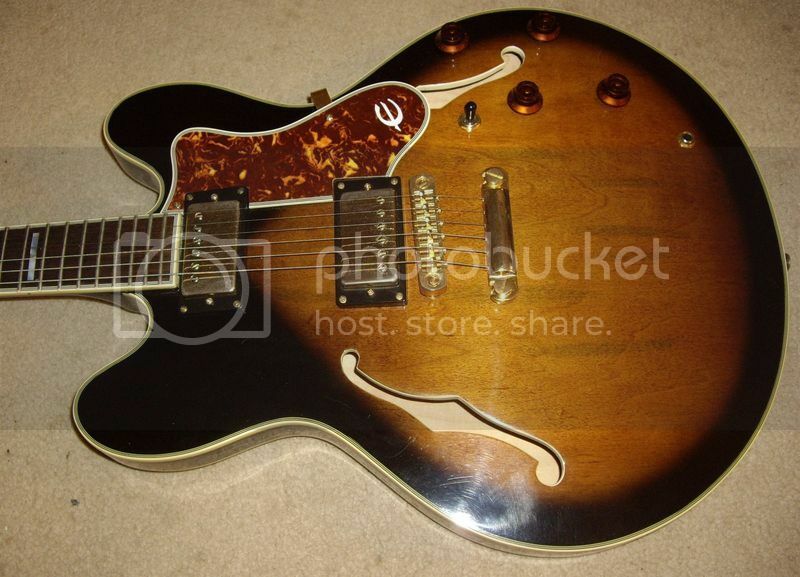 I would note that Gibson actually has many repeat serial numbers, particularly in the late 60s-early 70s. And I know Cort's were admitted by employees to have been total nonsense. Also, quite a few companies have very little for records. I contacted Epiphone once while working on a wiki, and all they had for the entire 1980s were a few random catalog pages. I mean, if you think about it, Matsumoku used their own serial format on Washburns, so Washburn them-self never had to think about it. Once Mats was gone, they had to scramble to put together a new lineup. Yes, I think it's very likely. Mats closed in 1987 but it's likely manufacturers were already switching to Korea before that, which caused their closure. I'll trust your word on the early 80s Japanese models. That bridge is certainly a unique feature I've not seen on a Mats before. 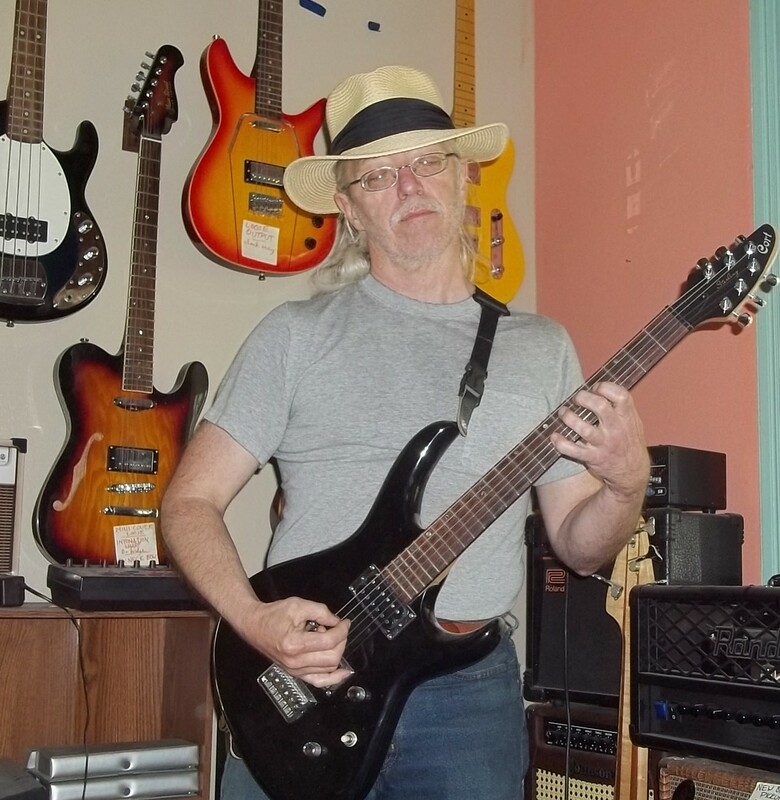 Here's what I think happened: The second one you posted was the first Samick-made HB, with the "Gibson-ish" headstock. 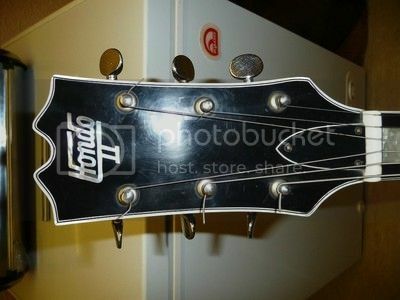 It's actually very similar to Hondo's headstock, which were made by (you guessed it), Samick. Since all the four digit serials start with 8, and after that we see them going to a longer serial starting with 89, I think it's safe to assume those were 1988 models. Now, we see some with the Hondo-ish headstock and serials starting with 89, suggesting they were made into early 1989. But despite the apparent lack of serial numbers on the Wing headstock models, it's inclusion in the 1989 catalog pretty much pins it down. By the 1990 catalog, we see the new and final headstock, body shape and knob placement. You'll notice those '88-'89 models were basically identical to the Epiphone Sheraton in body shape and features (notice it's a bit narrower than a true ES-335 shape?). The triangular truss rod cover is a common Samick feature. That wide bridge is one of the biggest defining features of a Samick build in my experience. The closest any other manufacturer made was Ibanez's wide bridge for the Artist models, but that was subtly different. The pyramid volute was not particularly common but was definitely used on some Samicks, so I know they were capable of it. Samick made the Sheraton starting in 1986. And I should add that the J6 was most likely the same story. Samick has extensive experience with Jazzboxes. They also built the Aria Pro II FA-70 at that time. I do, I have a 1999 SAN-450 but the original pickups were long gone when I got her. Now she's got a Burstbucker I in the neck and GFS Retrotron Memphis in the bridge. Good excuse as any to show off, I suppose! Anyway, the stock pickups on Samick's home brand models have pretty much always been unbranded, likely ceramic humbuckers around 8k Ohms, D.C. I have a pair from my SG. They sound great distorted but a bit boomy and unfocused clean, so I replaced them. I have heard of Samshins in Samick contract builds before, mostly for Epiphone around that same time period. In fact, I wouldn't be surprised if Samshin made Samick's unbranded pickups. They look pretty similar, having gold baseplates often with four screw heads and no polescrews poking through (but not always). Jin-Ah made a lot of their hardware and often did not label it. But pickups are easily changed and different manufacturers they're working with may choose to go with other pickups instead, so it's hard to say based on that. There are other smaller details that suggest Korean build as well, for example the use of a standard five-sided nut for the toggle switch, whereas Japanese manufacturers always used knurled nuts. Also, somebody in another thread posted a picture of a pot, which was a mini, not full size like the Japanese used. The box switch, mini-pots, yellow braided insulation, the grey wiring and blue and red pickup leads are all very standard Samick stuff. I own a Samick-made Epiphone Les Paul from 1986, so I can understand why they are mistaken for Japanese guitars so often. They were really killing it through the 1980s. Also, it helps that they were tutored by Tokai, Matsumoku and Gibson. In fact, many of their methods were directly copied from Matsumoku, which causes a lot of confusion for people who don't know. I found a 95 HB-35 on craigslist with pictures of the pickups' underside. That reddish-brown substance was how they typically held the cover on, still not sure what it actually is though. You can see this one was removed and soldered back on. That would be an 89 J-6 made in Japan. Nice!. If your surmise were to be valid, then clearly there were a mere 100 guitars made in 1989 at that plant -- like, s/n 8900 - 8999. Must be worth a few thousand $$$, considering that scarcity. It's little better to guess that the leading digit indicates 1988, because that means 1,000 could be built (8000 - 8999). I'm only guessing, but it seems to me that Washburn coulda sold that many just to the fans in downtown Tokyo. Until rather recently, serial numbers WERE NOT some sort of secret code. They merely tracked each guitar as it was completed, which is to say in a serial fashion. Until 1976, that's how Fender instruments were numbered (with some odd glitches). Some companies used various leading digits or prefixes in order to indicate different plants, assembly lines, shifts, design changes, etc. This is exactly why early Washburn (Lyon & Healy) instruments seem so chaotic nowadays. So, a recent Fender with a leading M is a Standard (made in Mexico), the next letter indicates the decade, & the next digit gives the year of that decade. The remaining digits are nothing but the next available number when the guitar passed inspection. And FWIW, realize that those serial numbers are 8 or 9 characters long, leaving room for (respectively) 100,000 or 1,000,000 units per year.